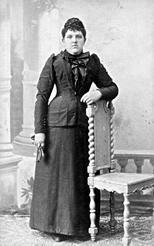 My great aunt, Anna Nieszner, was born in Karensebes, Hungary on July 13, 1870. She lived there all her life, which ended sometime after 1938. My father, Michael Mingesz, was very fond of her and gave her a blank book, which he inscribed with her name. This she filled with over 100 hand-written pages of recipes. Pictures of the hand-written book and some of the recipes are included on this site. 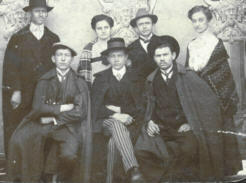 This photo was taken in Hungary about 1912, a year before Michael Mingesz (center) emigrated to the U. S.
Michael Mingesz was a monument craftsman and of very moderate means so one can assume that this was how middle-class city folks dressed. The attached is a picture of my mother and her family. Mom is the girl standing in the middle. The photo was taken about 1908 - my mother, Marie Schuster, was 16 at the time. 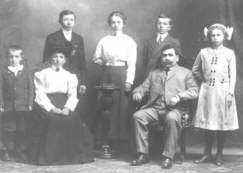 The photo was taken in the U.S. about two years after the family arrived here. They settled in Milwaukee, Wisconsin.